Question: A and B roll a pair of dice in turn, with A rolling first. A’s objective is to obtain a sum of 6, and B’s is to obtain a sum of 7. The game ends when either player reaches his or her objective, and that player is declared the winner. Find the variance of the number of rolls of the dice. Problem Tree: As we can see, the problem flow is fairly straightforward. The following simulation shows the means of the outcomes of a 1000 simulations, each containing 100 sub-runs. 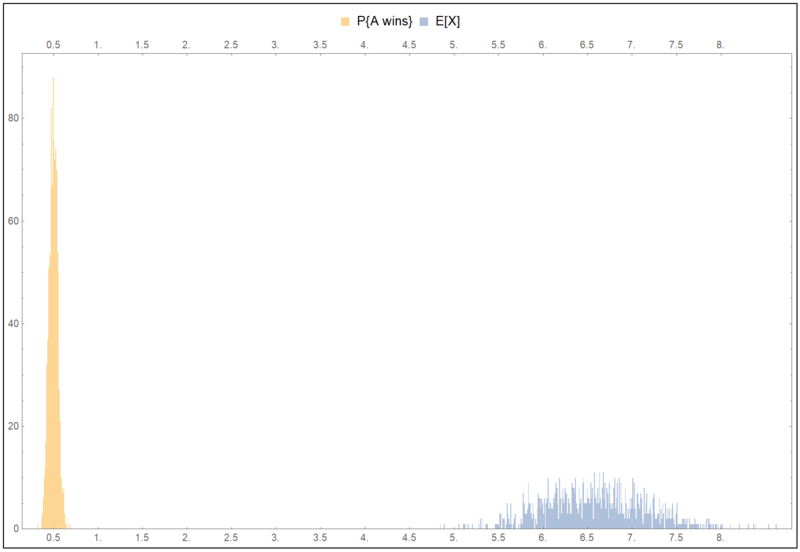 The histograms seem to be peaking above the calculated values from the section above. I wrote this one in Mathematica. A simple enough method to batch the outcomes. I used 1000 batches of 100 each to find 1000 means values and used that to construct both the histograms in a single chart. Let me know if there are issues with the code.